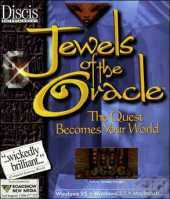 Jewels of the Oracle is a stationary puzzle game with no real story line or plot. A total of 24 well-designed, ingenious puzzles must be solved, each independent of the others. Most of them can be played in two difficulty levels (Easy or Hard), and the Oracle provides clues to help along the way. The beautiful graphics, where the puzzles reside, are designed in an Egyptian or Mesopotamian style. Music plays in the background to provide atmosphere, but it can be turned off if it gets repetitive. The basic layout is a hexagon around an Oracle's well. There are three doors on the outside of the hexagon, and the first one is where you begin the game. In each room is a puzzle you have to solve to get a jewel which must be taken back to the Oracle's well. The puzzles in this game can be compared to those found in The 7th Guest. The Chinese Checkers puzzle in Shivers rivals many of the ones contained in Jewels of the Oracle. Since there is no real story line or deeper meaning behind all this, Jewels is not an adventure game but rather a collection of challenging puzzles in a gorgeous setting. If you enjoy this game, be sure to play its sequel Jewels II: The Ultimate Challenge.